After a couple of nights eating out for Restaurant Week I decided to give our stomachs, as well as our wallets, a little bit of a break. 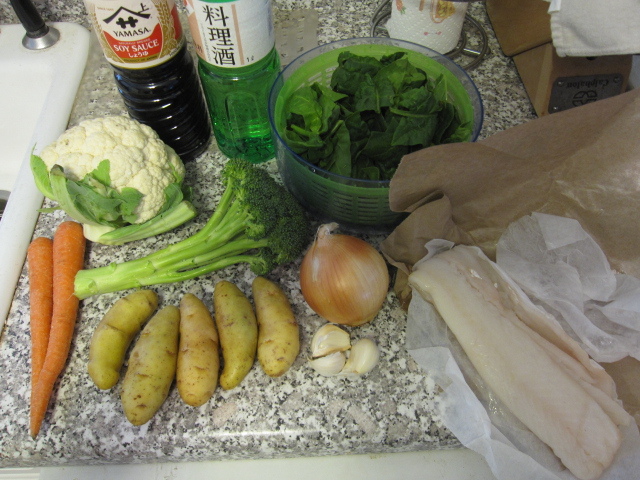 Simple, cheap, and delicious, I made a stew with cod and vegetables. Warm stews like this are great for cold winter nights and are packed full of nutrients that won’t bulge your belly or bank account. I started off with my typical dashi. 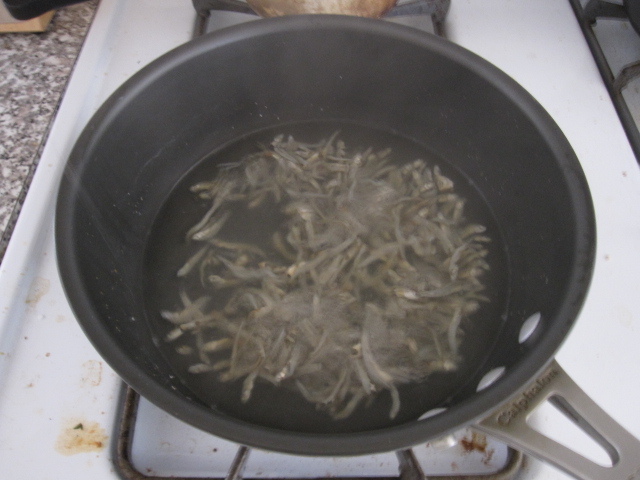 I boiled 1/3 cup of dried anchovies in 3 cups of water for about 30 minutes and then strained out the fish. 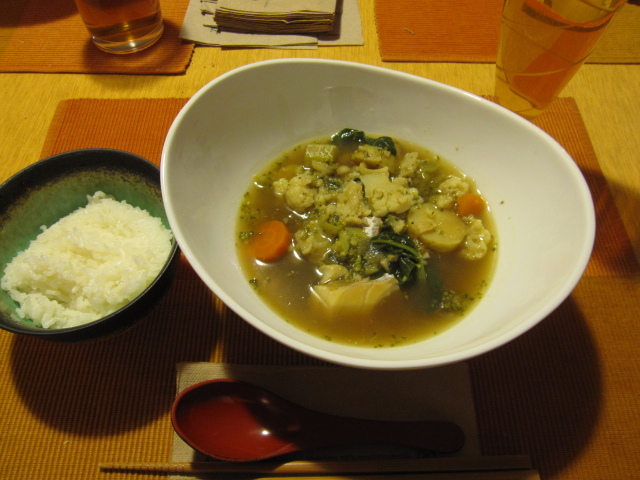 I really love making this dashi because it’s easy, healthy, and delicious. The rest of my ingredients included 2 carrots chopped, 1/2 head of cauliflower broken into florets, 1 head of broccoli broken into florets with the stem chopped, 5 large fingerling potatoes chopped, 1 onion large diced, 3 garlic cloves large diced, 5 ounces of spinach rinsed, 3/4 pound of cod cut into bite-sized pieces, 3 tablespoons of soy sauce, and 2 tablespoons of sake. I heated up a stock pot and poured in about 2 tablespoons of olive oil. Once the oil was hot and shimmering I added the onion, carrot, and garlic. I let that all sweat down for about 3 minutes and then added the broccoli and cauliflower. About 2 minutes later I poured in the dashi, soy, sake, and a bay leaf and brought that up to a boil. Once boiling I added the potatoes and turned the heat down to med-low so that it could simmer for about 10 minutes. Then I added the fish and let it simmer for another 10 minutes before throwing the spinach in. 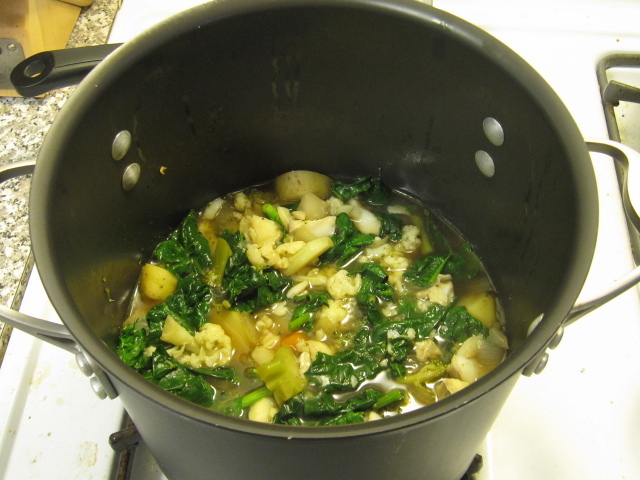 Once the spinach was in I seasoned with pepper (no need for salt because of the soy in the broth), covered the pot, and let simmer for another 10 minutes. After that all I did was adjust the seasoning and serve it up with some white rice. Just be gentle stirring after you add the fish, cod will flake apart. It was tasty, healthy, warm, and comforting! I’m warm, comforting, and tasty! What did you expect?